(1) The existence of Canonical metrics on Kahler Manifolds (Kahler Einstein cone metrics, Constant Scalar curvature metrics, and Extremal metrics). (2) The alpha invariant, log canonical threshold, and stability conditions from algebraic geometry. (3) Geometric Flows (Kahler Ricci and Calabi flows). (4) The theory of the Complex Monge Ampere equation. The first part of the workshop will consist of short courses delivered by the organizers and other senior mathematicians in residence. These lectures will be followed by student seminars which expand on the topics covered in the minicourses. 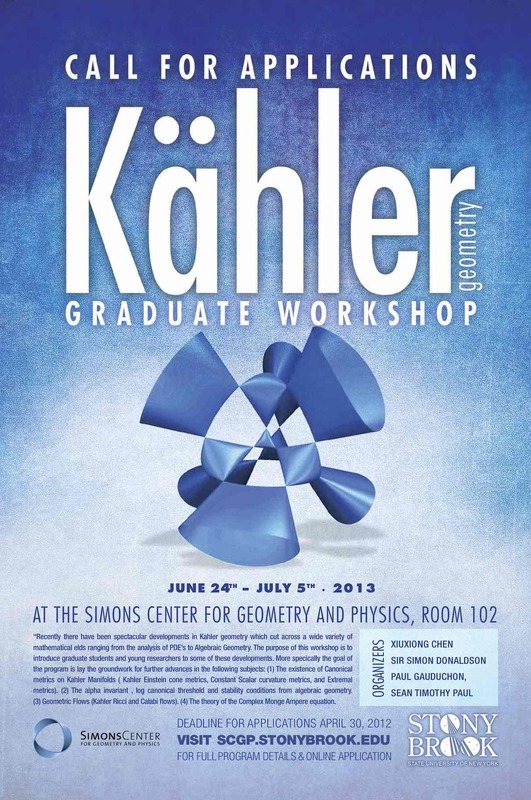 The emphasis will be on understanding Yau’s solution to the Calabi Conjecture (and its conical analogue) , Geometric Invariant Theory and Kahler energies, and the basic ideas behind Gromov Haussdorf convergence of manifolds with specific geometric constraints . Accepted applicants will be provided breakfast, lunch and local accommodations.